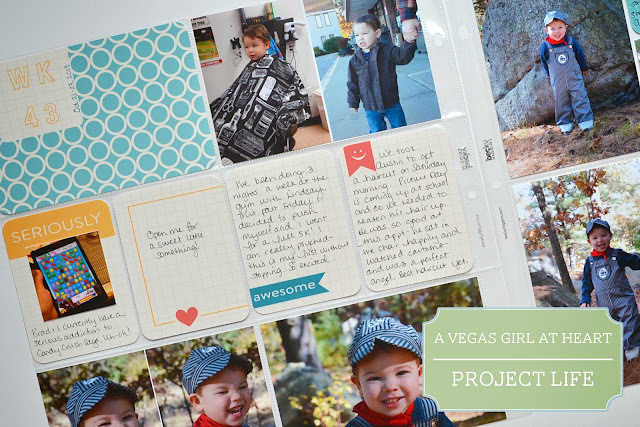 Welcome to Project Life 2013, week 43. This week I kept my layout very simple. No embellishments at all. 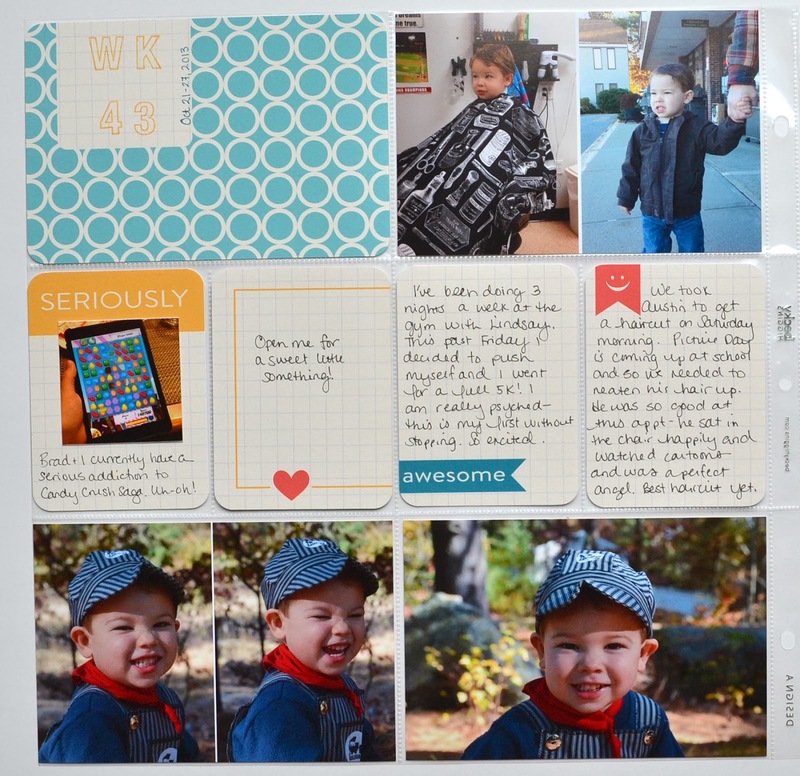 I used the Kraft Core Kit this week, in digital form. Once again, I chose my cards by viewing them on Evernote, printed them, and this time just added my journaling and slipped them into the pockets. 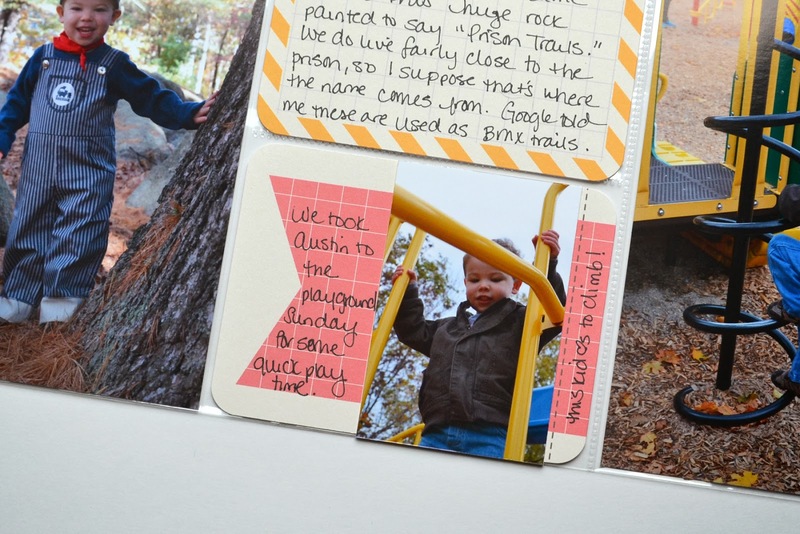 It seems this entire layout is about Austin. Most of my life revolves around him, of course, but usually I have something else to include. This week was pretty routine. In fact all of my photos are from the weekend. On the left page I did add a photo of a recent obsession of mine and Brad's - Candy Crush Saga. Oh boy. :) I also added another secret journaling card in the second pocket. I used Design D for the second page. 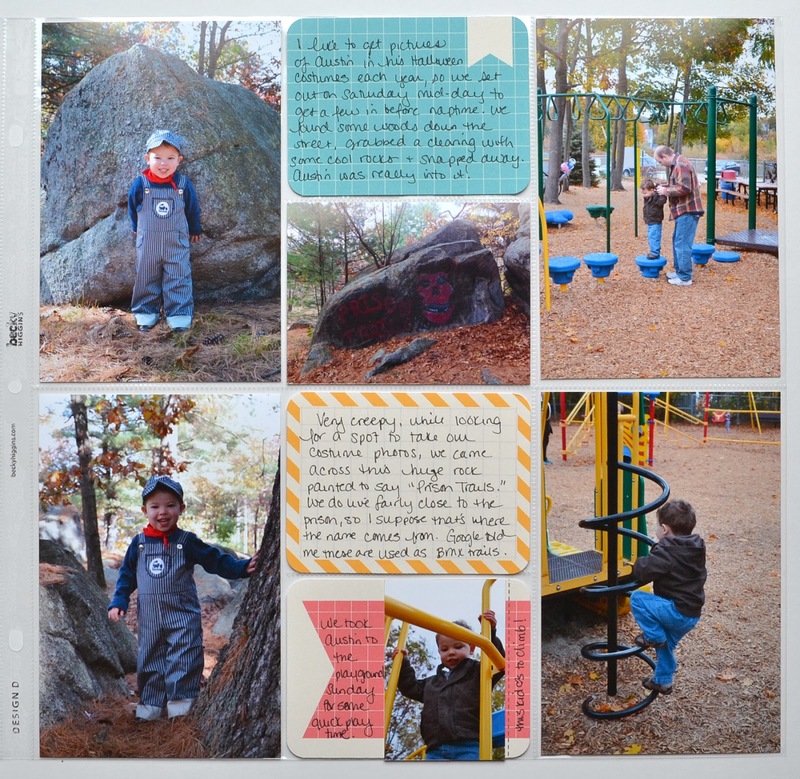 I don't often include a lot of large vertical photos in my layout but it happened that the photos I took of Austin in his Halloween costume along with photos from our playground visit were vertical. I really like the different orientation. I like this Kraft card with the stitching drawn in. I thought it was perfect to line up a smaller photo of Austin. 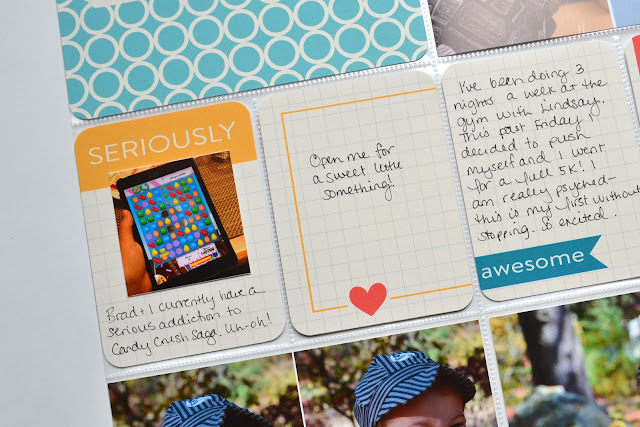 You might notice that my photos are square corners this week while I rounded my journaling cards. I used to really be annoyed by mixing the two styles of corners but I'm slowly getting over that and I actually like the combination of the round and square this week. I might just not worry about what is round and what is square going forward. That's it for this week. I hope you guys have a lovely week! 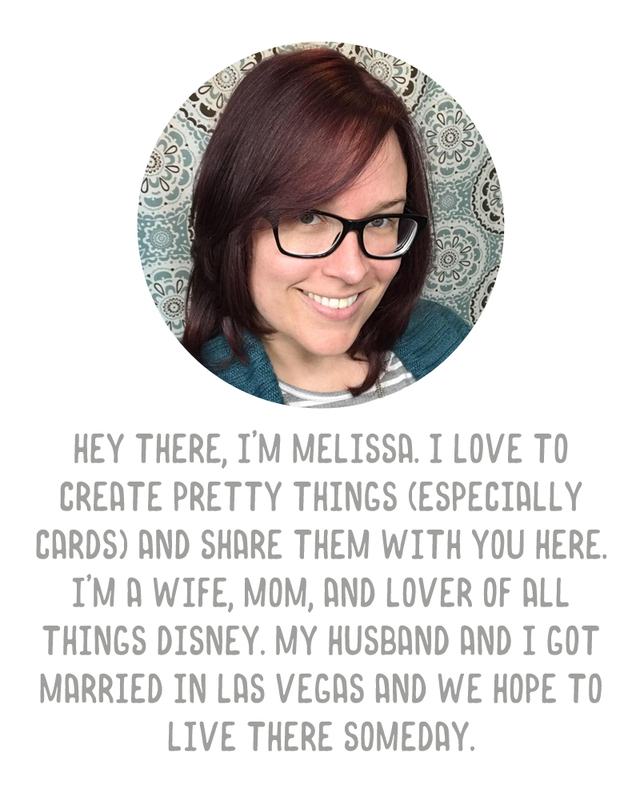 I actually really love the square photos and rounded fillers! I think it looks really cool, but still clean. And, I wanna open that secret square so baaaaaaadddd!! !